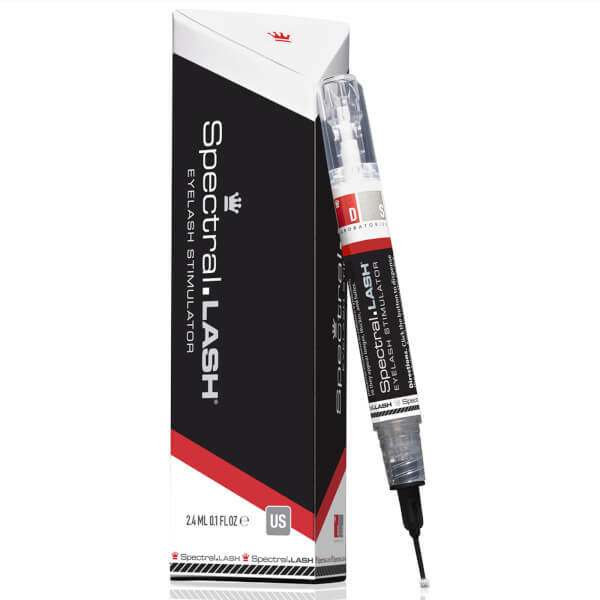 Achieve long, luxurious lashes with the Spectral.LASH from global leaders in developing high performance personal care products, DS Laboratories; a new and eye colour-safe formulation clinically proven to stimulate lashes to grow 25% longer over a four-week period. The enhancing formula deploys a breakthrough peptide complex (not a relabelled glaucoma drug like bimatoprost) composed of structural amino acids that work by stimulating the expression of keratin genes and by improving overall eyelid health for long, fluttery lashes. Click the button to dispense the solution. Apply by tracing the eyelid. For best results, apply twice daily, morning and evening. Water (Aqua), Hydrolyzed Soy Protein, Magnesium Ascorbyl Phosphate, Adenosine, Sodium Chloride, Disodium EDTA, Calcium Chloride, Lysolecithin, Safflower Glycerides Polyaminopropyl Biguanide, Hydroxyethylcellulose, Phenoxyethanol, Caprylyl Glycol.